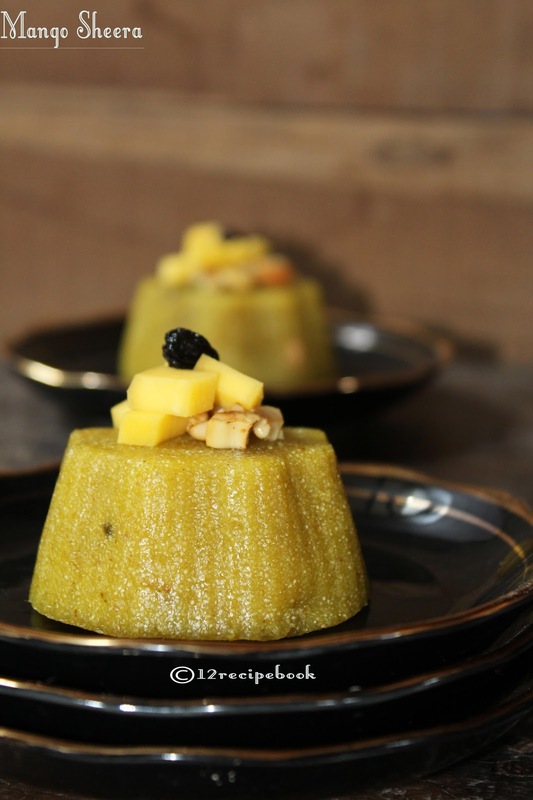 Mango sheera is a delicious dessert using ripe mango pulp and semolina. Ty this quick and easy halwa at home with simple ingredients. Heat ghee in a pan; fry cashew and raisins; take it out from the ghee and keep aside. Add semolina to the ghee and roast on low flame for about 5-6 minutes or until slightly starts changing its color. Then add sugar (or condensed milk) and saute well for few minutes. Add salt and hot milk in to it and cook by stirring well until the milk gets completely dried. Then add mango puree; mix well and and allow to thicken. Add cardamom powder and fried nuts. Serve warm or cool by topping it with mango pieces.